Home / Features / The Pels want transition defense – are they getting it? 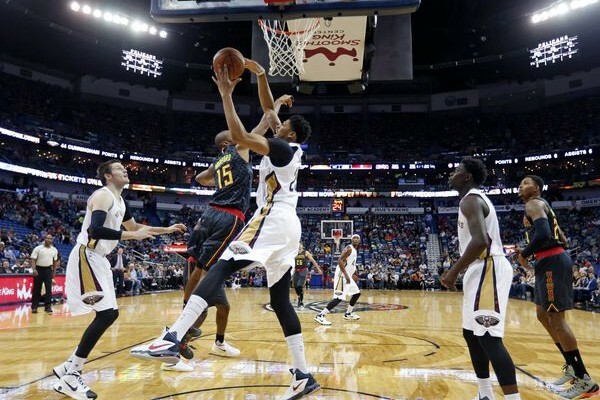 The Pels want transition defense – are they getting it? Gentry – and his coaching tree – are big proponents of transition offense. You heard all about pace in the off-season, and the general reason for that is transition attempts are generally worth about 1.09 points per possesion, or .1 more points per possession than their half-court conterparts. The flipside of that is that the Pelicans are also very focused on stopping transition points by their opponent. To do this, they subscribe to the standard method of not sending guys to the offensive glass, and instead having them get back on defense. So has that focus resulted in better transition defense? The answer is yes. This year, only 11% of opponent possessions have been transition opportunities. That is the best in the league. (league average is 13.3%) So if you are evaluating the Pelicans ability to limit transition opportunities, the Pelicans have been great. The net point, however, is the Pelicans allow 14.1 points per game from transition plays. That ranks 9th in the league. Last season the Pelicans were ranked 21st. So they have improved in this one aspect this year. BUT – and this dovetails into Zach Lowe’s latest piece about offensive rebounding and its league-wide decline – does it help the team really? The cost of sending those guys back are offensive rebound opportunities. Last season, the Pelicans had opportunities at 21.5 offensive rebounds a game, and grabbed 53.3% of them. This season, the Pelicans have a chance at 19.2 offensive rebounds per game – and grab 44.2% of them. It’s a net loss of 3 offensive rebound a game. If you figure out the number of transition opportunities the Pelicans are stopping (warning: this is fuzzy math based on estimates, there’s some data NBA.com only has for this year) around 3 and a half transition opportunities. Since there is a whole lot of unknowns in there; how good the PELICANS are at converting 2nd chance opportunities , would they defend transition attempts better or worse if there were more of them, does stopping transition offense make an opponent burst into tears, etc; I won’t do the math and declare which is better – offensive rebounds or transition defense . . . but . . . It feels like a wash to me.